When sending a job interview thank you email you’ll want to make sure you’re attention to detail is immaculate. Virtually every “How to Nail a Job Interview” includes a closing tip that emphasizes the importance of sending a thank you letter to the company. Although a thank you letter cements your high caliber interview performance, the method for expressing your gratitude has changed from typing out a thank you letter to sending your appreciation via email. Does sending a job interview thank you letter via electronic mail differ much from sending one via snail mail? The answer is no, except you need to include “Thank You” in the subject line of your email to grab the attention of the interviewer. After that, everything else about a job interview thank you letter follows the same game plan. Like resumes and cover letters, generic thank you letters turn off prospective employers. A canned job interview thank you email demonstrates a lack on initiative and it typically gets tossed in recycling bin, along with your job candidate file. You can use standard opening and closing sentences, but make sure to add specific information in the body of the letter that matches each company that interviews you. As with interview answers, prospective employers have no interest in reading lengthy job interview thank you letters. Include a salutation, attention grabbing opening line, one paragraph in the body, and a short ending sentence for the job interview thank you letter. The best way to ensure brevity involves using your own words and feelings to create the content for the letter. A job interview thank you email does much more than expresses gratitude for the chance to discuss a career opportunity. It also provides you the chance to reaffirm your interest in the open position. You walk out of an interview asking, “Did I get the job.” Well, the interviewer asks the question “Does she want the job.” A short job interview thank you letter answers the interviewer’s question. A job interview determines whether a candidate represents a good fit for a company, and vice versa. Job candidates should promote their greatest strengths in a job interview thank you letter to make a good fit stand out in the mind of an interviewer. However, don’t write a long paragraph highlighting your professional strengths. Simply list your strengths in bullet point form to keep an interviewer riveted to your thank you email. You have just created the consummate job interview thank you letter. After you click the send button, you confidently wait for a response from the company that interviewed you. The job interviewer loves your gratitude for the interview, but your email still finds the electronic trashcan because of a few typos and grammar mistakes. As with any other type of writing, put your final version of your job interview thank you letter on hold for a couple of hours, before revisiting the letter to proofread the content. 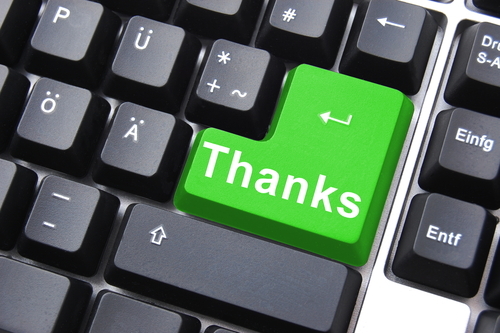 A job interview thank you email is better to be error-free than sent in haste. The narrowly targeted job interview thank you letter of the past has transformed into a thank you letter that includes gratitude for meeting everyone that you encounter during an interview. This means thanking the person that greeted you upon your arrival, as well as employees that interacted with you on your way to and from the job interview. Follow these job interview thank you tips and increase your stature among the myriad candidates chomping at the bit for a job offer. Enhance your stature even more by sending the thank you letter within 24 hours of the job interview. The interviewer might not open the email right away, but the time stamp indicates your promptness in expressing gratitude for the opportunity to discuss a job opening.